The RotaTherm continuous cooking system is now available with various cooling setups, vacuum flash de-aeration, indirect or in combination. The RotaTherm continuous cooker is the heart of the system and cooks products to temperatures in the range of 20 – 145°C. The product then enters the appropriate cooling mechanism. Generally, direct vacuum flash (de-aeration) cooling is used for homogenous product and can bring the product instantaneously to a set point temperature, while simultaneously removing entrained air. Indirect cooling is appropriate for shear sensitive products that need to be brought gradually down to temperature. Vacuum and indirect cooling can be used in combination with gradual temperature / pressure changes. One step uses indirect to bring the temperature down gradually. The next step uses vacuum to de-aerate the product to achieve density control. The cooling mechanism selected is dependent on the product being processed and the desired end result. The appropriate cooling setup is incorporated into the RotaTherm control system. 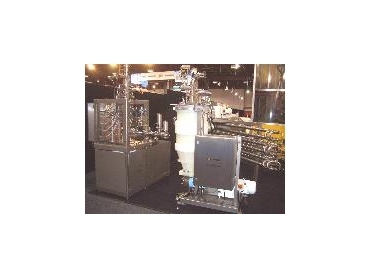 The direct steam injection RotaTherm continuous cooking systems deliver no product burn-on, good viscosity management, constant superior product quality, and formulation flexibility, with pause capability. The RotaTherm continuous cooking systems are available in configurations for pasteurisation, UHT and Aseptic, with throughput rates from 50 kg/hr to 8,000 kg/hr. The RotaTherm continuous cooking systems are available from Gold Peg International . For more information, click here for pdf.